Why emailing passwords is a bad idea. You may be reading this because somebody has got in touch and complained about you sending them their password as part of your signup process or 'forgotten password' function. I hope I can explain why this is not a good idea. Like everything else to do with computers, the world of internet security is constantly evolving. Ideas that seemed great just a few years ago turn out to be not such a good idea, and unfortunately this is one of them. There are a number of reasons why emailing passwords to people is now considered an unwise idea. Email was not originally designed to be secure. Emails are often delivered in clear text over the internet and stored as easily readable files on servers. Messages can also bounce to unexpected places when something goes wrong and people sometimes share email accounts. If you email a password, consider that an unauthorised person might gain access to your service. That is probably not something that you want, especially if that can result in reputation damage or credit card chargebacks. Humans aren't very good at remembering good passwords, so people often use the same password for many services. This means that if the password is revealed other services may be accessed. If this includes internet banking, social media or email account information, the consequences could be significant. When you accept a password and other personal information from a customer, you are taking responsibility for keeping that information safe. If you are able to email a password, it likely means that you are storing the password in plain text. This means that if your site is compromised attackers can potentially make off with the email addresses and passwords belonging to your users. This annoys customers and leads to bad publicity, which will be something you want to avoid. If your site is storing passwords insecurely, there is an increased likelihood that it has other security issues. You may believe that your site is secure, but with successful attacks against massive names like Adobe, Snapchat and Yahoo leaking customer passwords, it is best not to take the risk. Don't store passwords in plain text. You (or the product you choose) should use a one-way hash with key strengthening, such as bcrypt or PBKDF2. This may sound complex, but it is a way of turning a password into a form where you can verify that the right password has been used, but you can't tell what the original password is. A bonus side effect of these 'hash functions' is that they permit passwords of any length. You should also not encrypt the password in a manner that means it can be decrypted later on, as this is likely to be inadequate - think of it like using a padlock, but keeping the key next to it. Don't email a copy of the password when somebody signs up. The best way to handle forgotten passwords is to send the customer a link that will allow them to set a new password. It should be valid only for a short period (say 24 hours), and must stop working after the password has been changed. Passwords should always be transmitted securely - this means your site uses HTTPS and the little padlock appears in the browser. I don't understand this. I just sell things through my website. There's no secure padlock in the browser on your login / signup pages. Hopefully you can ask the people responsible for your site or the vendor of product that you use to help you out. Alternatively, please consider engaging the services of somebody who does understand the detail on this page. Like many people I've been using the wonderful (and free) Picasa to manage my photos. One of the huge benefits of Picasa aside from its fast and friendly user interface is that it doesn't write changes to your images. Instead it stores a record of changes that are made to each original image in a Picasa.ini file in each directory. This means you can make changes to your images in Picasa, such as adjusting the contrast and brightness or cropping (or marking with a star), and you don't need to worry about it overwriting your original images. In order to keep performance reasonable it stores a cache of these adjusted thumbnails and the changes in your Local Settings directory too. I discovered a problem with Picasa's method of updating these Picasa.ini files though - if you make changes to a file, and then move it to a different folder, within picasa, it doesn't update the original or the new .ini file. This means there's a record of the changes still in the old directory, but not the new one, but it doesn't seem to matter because Picasa tracks this information in the Local Settings database. The problem comes if you lose the database, or (as I did) intentionally delete it. Picasa will happily then trawl back through your pictures directory and rebuild most of the information from these .ini files. Unless you've moved the images to a different folder after editing, in which case your changed will be lost. The frustrating thing is that this information is still available, picasa just doesn't know where it is. If your camera doesn't keep track of file names (they return to 0001.JPG after emptying your memory card) this almost certainly won't work properly. If you've made changes to the image in the new folder too, they won't be updated or merged. It will warn you if there's filename duplication though. I ran this on a linux computer. It should work on windows too, using something like activeperl, but I've not tested it. If you do find it useful, please do let me know, and remember, back up your files before using this script. It works for me, but I make no guarantees that it won't mess up your images. BBC News reported that a number of .ac.uk sites are being used to sell counterfeit drugs at the end of last week. I wish I could say this surprised me, but knowing how complicated the issues are in sorting out web security at the university where I work, I can't say it's come as a massive shock. At a university it is often the case that a department may be responsible for their own web presence - usually someone for who it is not a priority, and they may know nothing about the technical issues involved. Sometimes a department will have had a third party company supply a site or content management system without realising it needs to be kept up to date. Even where there is a good level of centralised support for web publishing, some departments may do their own thing for historical reasons. We've been fairly proactive at working with departments and getting our own house in order, but it's certainly been a challenge to have security taken seriously across the institution. While incidents like this are unfortunate, they do have the positive side-effect of raising the profile of these issues, and longer term this can only be a good thing. These will alert you to any new pages that appear on your site with those terms. It's not perfect, but it will alert you to some compromised pages, or even comment spam on wiki pages/blog posts that should be dealt with. After playing around a bit, I moved on to connecting the 8x8 displays. 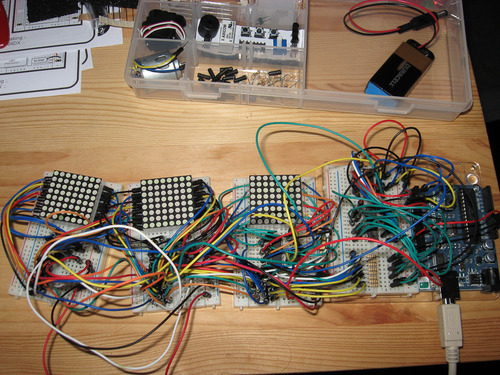 I spent a bit of time thinking about how best to do it, and had come to the conclusion that using a 595 shift register to drive the anodes of each display was the way forward. I'd ordered some ULN8023A darlington transistor arrays which can sink up to 500ma of current. 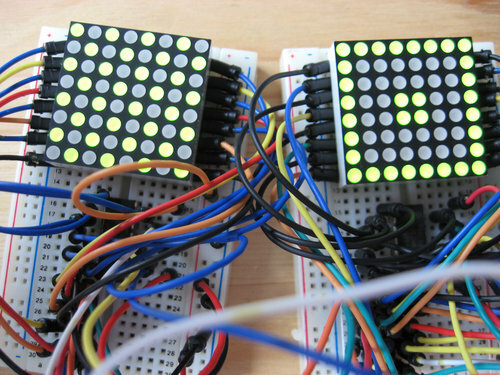 This is less than I was planning to draw through the 24 LEDs that make up a row, so the plan was to connect the cathodes of all the LED matrices to this chip. 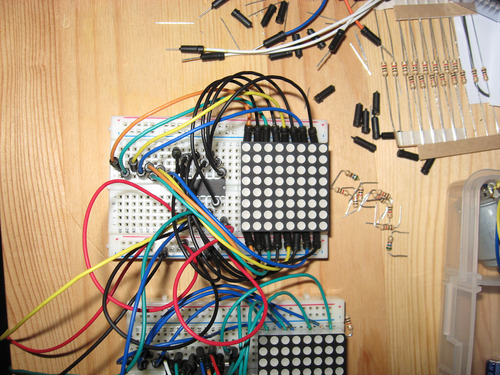 Again, a 595 shift register controls the 8023, so it means I can directly address each row and column in the same way. 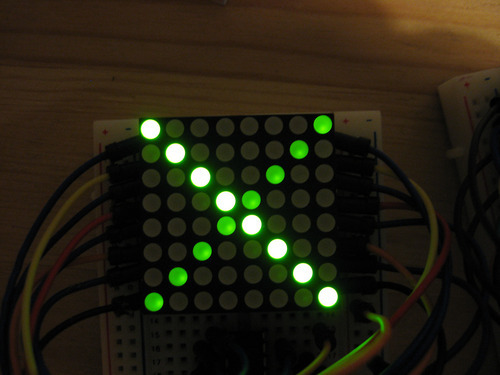 Once I'd got one 8x8 display working, it seemed like checking it all worked properly was a plan. It did, so I moved the current limiting resistors over to the 'y-axis' board, and started building the other 2 display boards. 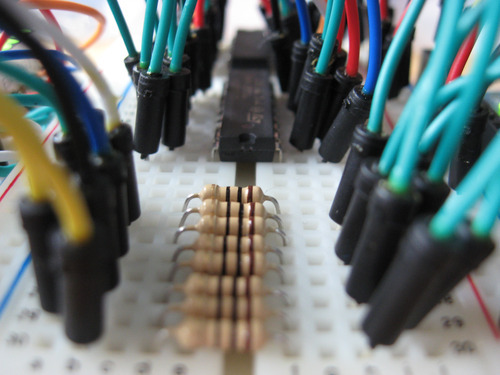 Here you can see (from the top) one of the 595 shift registers, the 8023 darlington array and 8 current limiting resistors. These collectively make up the Y-axis board, which controls the cathodes of all the displays. Each of these is operated in turn very quickly, lighting up an entire row. These are scanned quickly enough that the image on the display seems to be complete, thanks to the persistence-of-vision effect. Putting all this work together, I still had to make the software driving the display useful, rather than just pushing out hard-coded bitmaps. Finally, I need to run some of the LCDs at a different brightness level. I modified my code to maintain 2 arrays and 2 byte caches. One contains the 'bright' LEDs, and one the 'dim', and these are lit alternatively for different periods to create this effect. Again, the refresh rate needs to be fast enough that it's not obvious to the human eye, and that's where I started to run into problems. 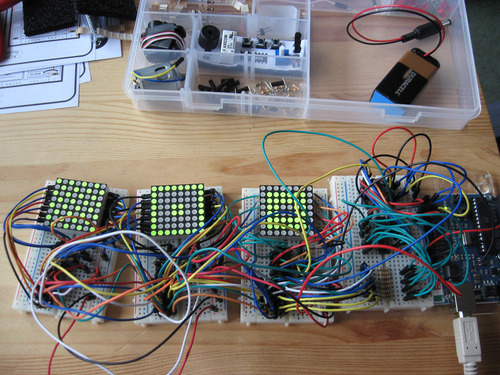 Switching between the 2 display layers for the 24x8 display, multiplexing the rows, and varying the duty cycle of different LEDs seemed to be getting too much. I couldn't do all that fast enough to keep the refresh rate sufficiently high - the dim LEDs were showing horrible signs of flickering. 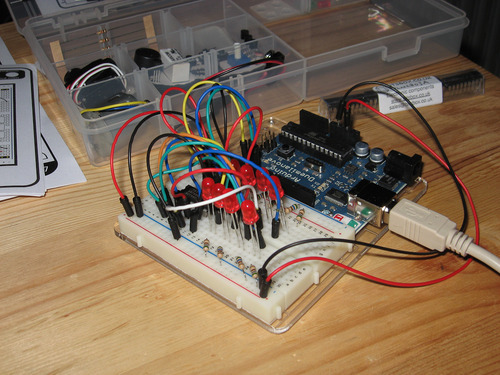 I turns out the shiftOut and digitalWrite functions provided by the Arduino software are pretty slow, and this becomes a problem when you're pushing a lot of data. My clever byte caching wasn't actually making a difference since it seems the shiftOut function turns that back into individual bits for output, which I could have done myself without the intermediate layer. Fortunately it seems I'm not the only person who's had this problem, and thanks to the extremely clever MartinFick on this forum post, I replaced the shiftOut and digitalWrite calls with shiftRaw and fastWrite. The difference in performance is staggering - I have much more control over the duty cycle again, and there's no sign of flicker. 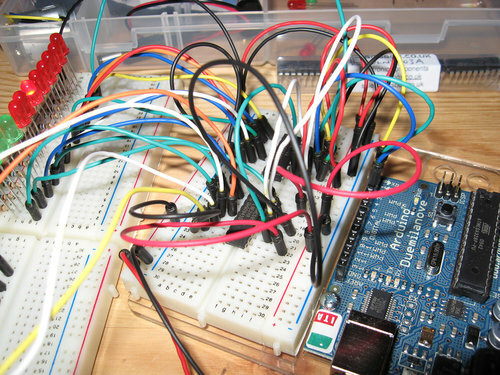 After a little more fiddling on Friday night, I had a bunch of LEDs connected to one of the 595 shift registers following one of the Oomlout example circuits. 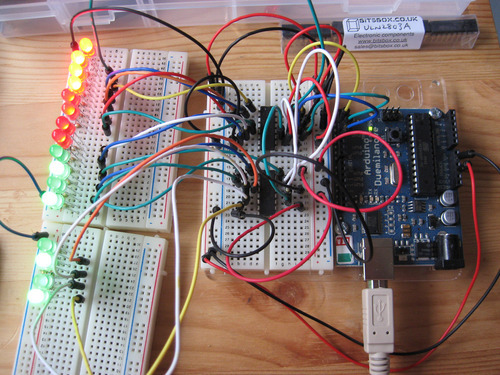 I added a second shift register chained off the second to run another 8 LEDs, again following an example circuit, but this time from the Earthshine Arduino Guide. This naturally meant cool lighting effects. 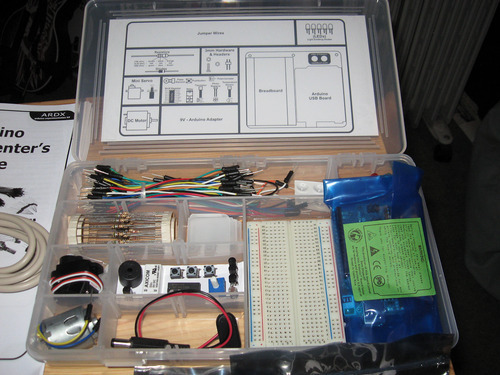 So, my plans to build the Game of Life Clock took a step closer to reality today with the arrival of my order of stuff from Oomlout following the recommendation of a couple of people. Everything turned up within 24 hours of placing the order. Very impressed. 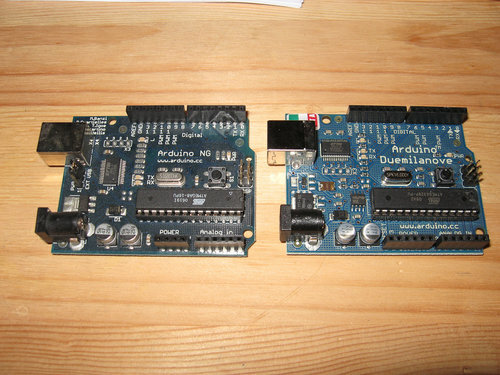 In addition to the 8x8 LED matrices I needed, I bought a new Arduino Duemilanove, since my old NG only has an ATMega8, with 8k of ram. 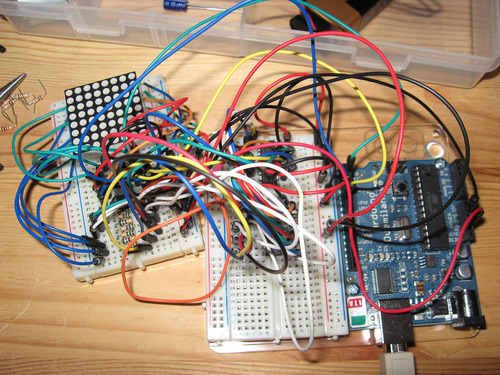 This has been fine for tinkering, but was looking a bit tight for running the game, RTC and matrix driver chips. The Duemilanove has 32k of ram, which is tonnes more than I need. 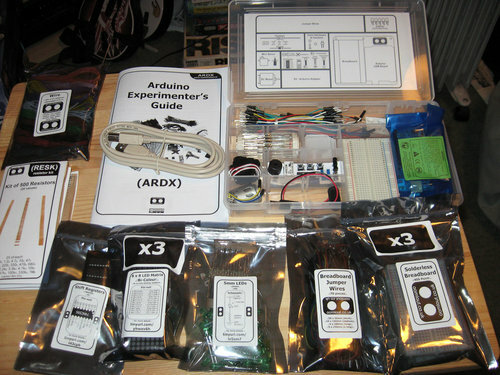 It also gave me a chance to order the ARDX starter kit, which in addition to the Duemilanove has a bunch of extra stuff to play with. 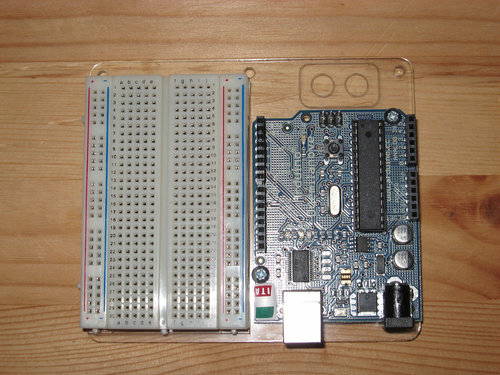 Given the Arduino-heavy nature of some of the dev8D workshops this year, it seemed like it'd be worth having some extra bits to play with. 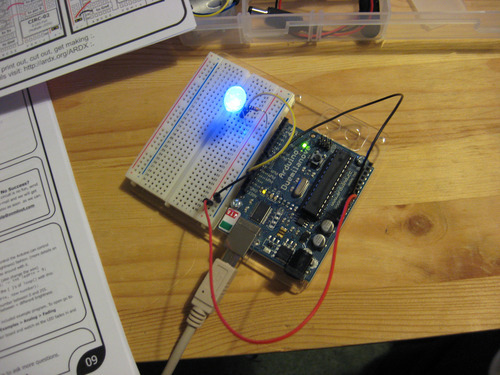 I've not really done much this evening other than have a play with the first starter kit circuit, and get the latest arduino software up and running. It is worth noting that the 10mm LED that ships as part of the starter kit is a bit "argh, my eyes". One thing that did come as a bit of a surprise was not having to hit the reset button to upload a new sketch. That'll take some getting used to. There are so many issues with this form that I'm not sure where to start, so I'll begin at the top. 1) Horrible JPEG compression on card images and the text around them at the top. There's no ALT text for that image, so a screen reader for the blind wouldn't see that information. 2) "Notified terms and conditions apply" - What does this even mean? I haven't been notified of any T&C at this point. If this is supposed to count for the notification, where are the terms and conditions? 3) "Security Card Number" - What security card? Card Security Number might make more sense. If you're going to use a term that requires explanation, you may as well use one of the standard terms, such as Card Verification Value or Card Security Code. This field doesn't line up with the label text. 4) "Card holders name as it appears on the card:". This should be "Card holder's name". This text is too long, redundant, wraps on to the next line and is redundant. Surely most people understand that the name on the card should go here? Failing that, simply "Name as it appears on the card:", or even "Name on card:" - shorter, avoids the grammar pitfall, and reduces repetition. 5) Make the 'if other' title text box bigger, at least to line up with the right edge of the other fields. If you've got to type 'Brigadier General' into the box, it'd be nice if you can see an entire word at a time. 6) The Card number, expiry date, security card number, and address boxes don't line up. 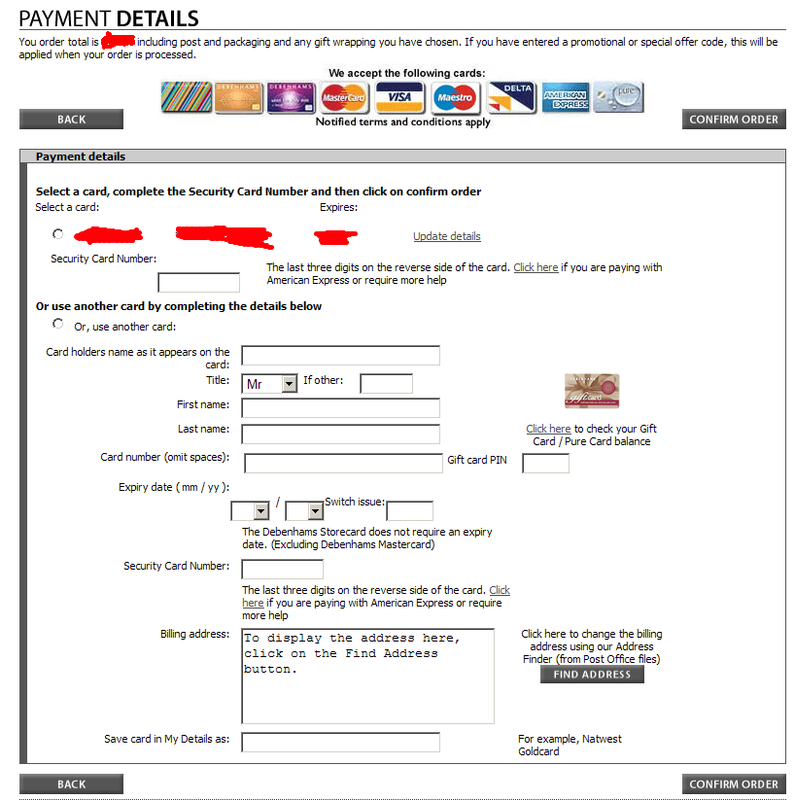 7) Card number (omit spaces): There are no words for how much I hate this behaviour in payment forms. It is such a simple thing to automatically remove spaces when the user clicks 'confirm'. Why not let the user enter the number as they feel comfortable and sort it out for them? If for some inexplicable reason this can't be fixed, at least the wording could be improved; "omit spaces" is a horrible phrase. "Without spaces" would be much more friendly. 9) The gift card image and balance check thing - why is that there? Was it positioned using some sort of 'pin the tail on the donkey' game? At the top of the page before someone is already expected to have made a decision about which card to use would be much better. 10) I've already mentioned that the fields don't line up vertically, but have the 'expiry date' and 'switch issue' fields and labels been out for a heavy night on the beer, stumbled home and collapsed? 11) "The Debenhams Storecard does not require an expiry date. (Excluding Debenhams Mastercard)" -- Why say this? I assume the store card doesn't actually have an expiry date on it, so there's not one for people to enter? Even if they do manage to enter something, why not just ignore it if you don't need it? 12) Billing address - why have a big editable box with an explanation as to why you can't edit it? Why not put the 'find address' button (which clearly doesn't need all that explanatory text) where the textarea is, and make that not look like it's an editable field. 13) Why have 'confirm' button at top and bottom? I could understand having one after the 'select a card' bit, and another at the bottom of the 'new card' form, but the positioning at the top looks really odd. Why are the confirm buttons outside the form frame around the form? 14) It is impossible to operate this form by keyboard only - you can't trigger the 'find address' button or confirm order buttons without using a mouse. I work for a large organisation, so I know how things like this evolve over time with the input of various people. When things change gradually over time, the decline in customer experience is often overlooked until someone points it out. In this case, I think this form provides a pretty bad user experience, and that will not encourage people to shop online with Debenhams. On Sunday the 21st of June 2009 I took part in the annual London to Brighton Bike Ride for the British Heart Foundation. We'd stayed the night with a family member who lives in Mitcham who lives around 4 miles from the start. I ate breakfast, showered, dressed and left at 6:45 for my 7:30 start, arriving with plenty of time to spare at 7:15. As the route passes the end of the road we were staying in, I followed the stream of cyclists in reverse but needed to hit the pavement in a few places to avoid the completely closed roads. Unsurprisingly, there were lots of cyclists on clapham common, with the 7:00 starters still leaving at 7:30. I got through the start gate (and had my card stampted) at 7:45. It took a full hour to cover the 4 miles back to to Mitcham riding past the road I'd started from due to lots of stop/start for traffic and cyclist-related congestion. After a relatively uneventful ride, we eventually made it up the hill to Woodmansterne (where I got married) 12 miles in to the actual ride at 9:30, where I met my wife, brother in law and mother in law. Refilled water, ate some food. Getting back on the bike, there was a nice fast run down rectory lane before dismounting and walking up How Lane again due to congestion. I stopped off at rest stop D 20 miles in for a bacon and sausage sandwich, and to rest my legs briefly. I left stop D after a decent rest expecting to gently spin my way up Church Lane, to discover massive congestion. Not even a walking pace - a few steps at a time, taking 30 minutes or so to cover maybe 1/4 of a mile. Turns out the delay was due to letting cars past so cyclists can cross the A25 road a few at a time. Eventually we got past and carry on through a reasonably flat section of the route. I was starting to run low on water about 27 miles in, so called in at stop F for some water. This turned out to be a mistake, as Burstow scouts were insisting on a minimum donation of 20p for a refill of tap water. It even tasted odd, the little gits. I moved on quickly after getting the water with the intention of my next stop being Turners Hill. Pretty good and mostly uneventful run up to Turners Hill although I walked up part of the hill at this point as my legs were starting to get tired. I stopped again briefly for water which was being handed out by the extremely energetic kids from the local church, and decided to pass on this extremely busy rest stop. It's a nice fast run run down to Ardingly, where I made a proper stop. This turned out to be the right decision as it's a nice location for a rest, with a good BBQ, and decent cups of tea on offer from Ardingly Scouts. I was definitely starting to feel the tiredness at this point, so the rest was welcome. I was expecting a nice easy run to the bottom of Ditchling beacon at this point, but the route profile we were given lies a fair bit. Lindfield was pretty, but the extremely long hill up through haywards heath is unpleasant and extremely draining. I gently spun my way up this trying not to wear my legs out. I stopped at Wivelsfield for more water and a brief rest, then on to the bottom of ditchling beacon. Again as you approach the bottom of Ditchling Beacon there's a few miles that are surprisingly lumpy and gently uphill, which doesn't help. I stopped at the last stop before the beacon for more water, a hotdog, a banana and a rest before tackling The Hill. Ditchling beacon, at 700 feet of climb in just over a mile was exactly as hard as I'd heard. While I suspect I could (slowly) cycle my way up if I were fresh, after riding over 50 miles I had almost nothing left in my legs. I walked up slowly, just like most other people. The last 3-4 miles through Brighton are fairly frustrating with a lot of stop/start for traffic, especially as you know that you're so close, but it is thankfully all flat. Finally I made it to madeira drive on the sea front, the finish line in sight. It was an amazing feeling crossing it after so much effort. I got my card stamped and collected my medal, grinning like an idiot. Then I realised I had about 20 minutes to get to the coach back and I had no idea where it was. I asked one of the marshals who directed me back past the 2 piers and on to Hove sea front. About a mile away was what the paperwork said - in reality closer to 3 which I could have done without, especially as it involved navigating round hordes of pedestrians and tired cyclists. I made it with a few minutes to spare, loaded my bike onto the lorry, and collapsed exhausted on the coach, a total of 61 miles down. I'm a bit annoyed that I didn't have enough spare time to make it a metric century. It was extremely hard (for me, anyway), but an amazing amount of fun. I'm also extremely pleased to say that so far I've raised over Â£700 for the BHF. This site has a load of info about the London-Brighton route, including the elevation profile.